This is a must try dish from the Malabar item from my chicken dish list. This is a whole chicken fry but we malabarians called it Kozhi Nirthi Porichathu nothing but the chicken is fully fried in its whole form. This full chicken fry is not just a normal fry it has been computed much more spices and ingredients. I have done the cooking with a the normal chicken hear and you can use spring chickens also. 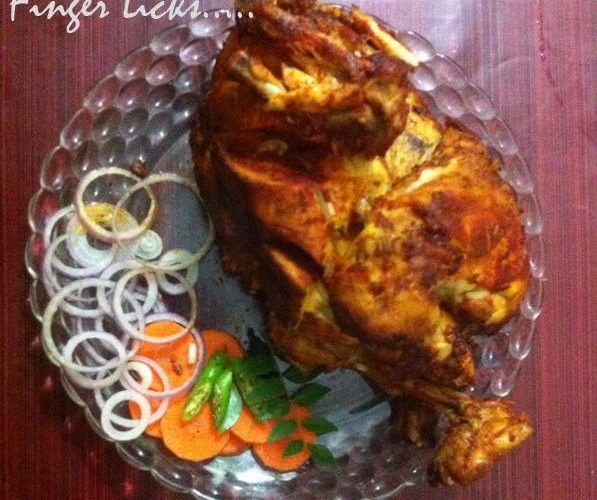 The whole chicken is marinated with spices and ginger garlic paste in lemon juice along with garam masala and coriander leaves and primarily it has to cooked in a cooker to its half done and again it is fried in oil. The pre-cooking will increase the flavours to snap on whole parts of the chicken and when it fried again it will give a crispy form also. This will leave your mouth watery undoubtedly. Come on friends I know none of us cannot leave leave it without a try. Enjoy your meal time with this full chicken fry. Mix all ingredients and make it into a paste by grinding. Then marinate the full chicken with this paste. Keep it for 1 hour. Then put it into a pressure cooker. Pour 2 tbspn of water into bottom and cook for 3 whistles. Then heat oil in a pan. Shift the chicken into the pan. Now you can apply the chilly paste to chicken for more taste. And cook each side in low flame.Your full chicken fry is ready. I am a food lover. Love to investigate new recipes. A dreamer, love musics, like to travel, and most of all a happy mom.